The bridge to Short Gap was surrounded by the Lady Falcons swooping down inundating Moorefield with attacks as Frankfort unleashed a three straight set match victory during senior night last Tuesday: 25-11, 25-10 and 25-9. “Obviously we didn’t play well at all tonight. We didn’t move and we can’t continuously bump it back, because when we bump it back there it’s just a tee-off. We didn’t cover our zone areas well which is due to a lack of movement. 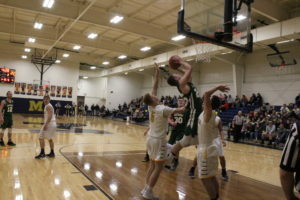 Overall it wasn’t a good night for us,” Moorefield coach Morgan Hill-See commented. The Frankfort senior ceremony was a nice production with each senior thanking every teammate, coaches and parents. Frankfort’s Jordan Irving smashed the ball for a kill after a serve by Moorefield’s Lindsey Rinker opened the first set. 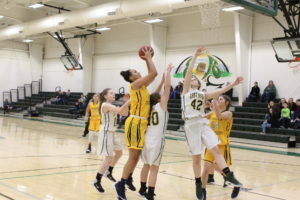 Irving served and the ball was returned by Moorefield’s Alyssa Vetter, but the Lady Falcons maintained possession with a spike by Kayla Grose. An attack by Frankfort’s Macie Miller was met with a dig by Moorefield’s Anna Riggleman which ricochet out of bounds. Irving’s next serve was too low and hit the head of teammate Makenna Douthitt and both laughed about it. Vetter served and the ball was returned out of bounds by Grose for a 3-2 score. 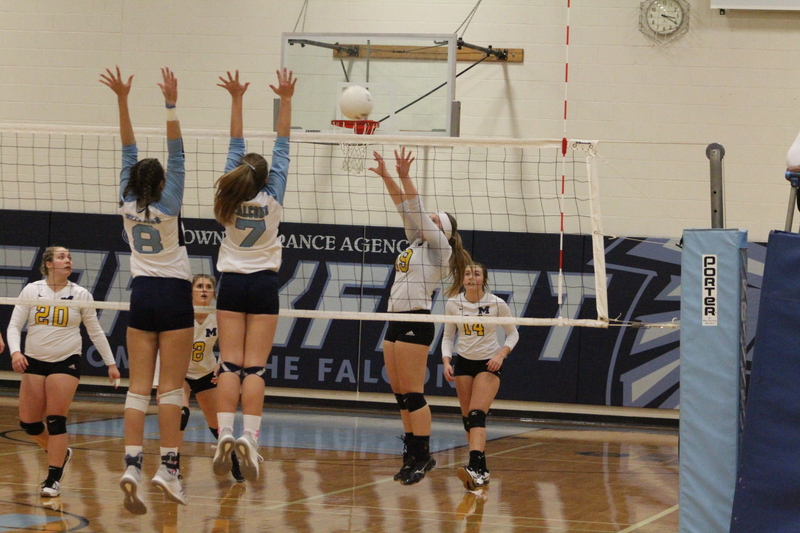 Riggleman and Sydney Hardy made digs, but the Lady Falcons kept attacking with Miller finally locating the floor. Moorefield’s Hanna Carlson and Madison McGregor put a little too much power in attacks sailing out of bounds, 8-2. Miller notched a kill, then McGregor’s attack was returned into the net by Grose. Hardy made a dig and Gracie O’Neill returned the ball for the Lady Yellow Jackets, then Frankfort’s Taylor VanMeter made a save and there was a violation at the net on Moorefield, 11-3. VanMeter garnered a kill, then the next attack was met with a dig by Riggleman and not returned. Miller spiked the ball, then Riggleman blocked a volley and it was saved by Grose setting up a point for Reagan Bennett. VanMeter tapped the ball over for a point, then the Lady Yellow Jackets hit the ball twice on a save by Grose. Grose’s serve went awry, then Hardy’s serve was redirected into the net by VanMeter for an 18-5 score. Moorefield’s Remington Hinkle made a dig and Lindsey Rinker set for Riggleman’s attack returned into the net. Hardy’s serve wasn’t returned, then delivered two aces for the Lady Yellow Jackets creating an 18-9 score. McGregor made a dig on an attack by VanMeter, then Rinker sent the ball over and Miller answered with a kill. Irving made a spike, then a volley was blocked into the net by Rinker and deflected out of bounds, 22-9. Hardy made a couple of digs, but the attacks continued with VanMeter and Irving making points before one launch went out of bounds. McGregor served an ace, then Frankfort finished the set with a kill by Irving, 25-11. 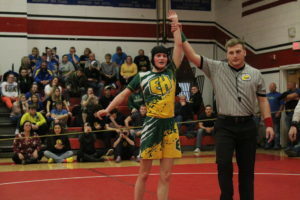 “Any team wants to win on senior night and it is really nice they all got to play at the same time together and that doesn’t always happen based on our rotations,” Frankfort coach Brooke Alkire noted.